What's Kirby's latest like? Find out here! After the excitement of the first day of E3 there's still plenty to see and do in Los Angeles. Today Corbie will be pounding the floors of the Convention Centre to visit booths from Namco Bandai, NIS America, Warner Bros., Nintendo and more. Keep this page open and Corbie will keep updating it with fresh information and opinions throughout the day. Got to play Cave Story 3D and holy sh*t did it look and play good. Went WAY beyond what I expected from it. That is one to keep your eyes on! BTW, for all you Xbox 360 owners out there, played Magical Drop V on XBLA and it was fantastic. Very reminiscent of the Neo Geo titles we have on the VC. Alright I'm heading back to the LA Convention Center in about 20 minutes to check out and play Cave Story 3D. Impressions coming soon. @CorbieD: Kid Icarus: Uprising is one intense game. It might not be the classic Kid Icarus we all know, but you can't help but love the action! @CorbieD: Got another crack at Mario Kart 3DS just about 15 minutes ago and that game is extremely well done. Some of the best tracks of the series! @CorbieD: For those of you who don't know, Next Level is developing Luigi's Mansion 2 for 3DS. And so far it has been the best game I've played at E3. @CorbieD: I'll be attending the second Developer's Roundtable laster this evening. It's with a mystery third-party developer. Could it be Next Level? @CorbieD: @Mray901 It seemed to have most of them, but with only a handful of levels to see in Sonic Generations to compare, it was difficult to tell. @CorbieD: Trying to track down Tyrone from Nicalis so I can check out Cave Story 3D. He's a hard man to find, but I'm very persistent. @CorbieD: Sonic Generations on 3DS has some really great 3D depth and you'd be shocked at how well it compares visually to PS3 and XBX360 versions. Played some Skyward Sword about 30 minutes ago and they've got that game really polished up and ready to roll. This might be the best 3D Zelda title of them all. A blast to play and very challenging. @CorbieD: Got to play Kirby Wii and it was a gorgeous game and a lot of fun. It's a bit easy, like most Kirby games, but it has some great co-op multiplayer for four players. Controls are perfect! @CorbieD: Just played Sonic Generations 3DS. Looks stunning and plays really well. Seems a bit like a cross between Colors and the old 16-bit games. @DaddyNewts: New Animal Crossing trailer looks ace: change trousers and shoes, go swimming, slow walk for bug-catching, furniture on walls! Another busy day of E3 lies ahead, with so much to see! cool. cant wit to see if you can get some scoops. Their time and Finland's time doesn't fit too well. NL keeps updating when I sleep and then there's few pages of information when I wake up again tomorrow... I can stay awake for few hours but I'm so sleepy from yesterday, I could sleep only few hours, don't know why. Maybe I was too excited after watching E3. @Late Yeah, same here Have had trouble sleeping since weekend. In an interview with Gametrailers, Reggie hinted at some announcements during the roundtable tonight. Namco? Hope they have Tekken 3D on display! I doubt it though. 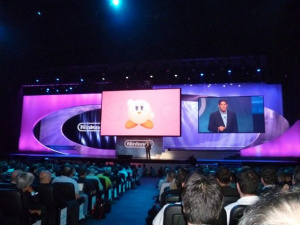 Also hope we get more awesome games announced at that meeting ballkirby mentioned. There is a second one tonight, so says Reggie in the interview. Not sure if it is in that part, but it is in the interview somewhere. Hopefully this round-table discussion reveals some new stuff! @13 Please don't call every FPS a "Call of Duty clone"
Namco Bandai and Nis America? Quick, Corbs, ask about Tales of! Sonic Generations sounds really sweet. Hopefully Zelda Skyward Sword isn't ridiculously challenging. Kirby Wii sounds good. I'm way more excited about Luigi's Mansion 2 than I thought I would be. I got the original for £7.49 (later the equivalent of 1000 wii points) back in the days of the 'cube in a bargain bin somewhere. Not exactly challenging, but one helluva fun game. There are loads of games there that I want. Mind boggling. EVERY GAME CORBY PLAYS IS THE BEST GAME EVER. How does MK3DS play out though? It seems quite interesting how you can race in the air, sea and on land... can't wait to pick that up, god I'm gonna be bankrupt soon, too many awesome games. Bless your dear heart, Corbs. These tweets are making me sooo jealous. Gotta love Corbie's optimistic attitude! I agree with Mickeymac about tales of. Do you know if any of these games are there: Xenoblade chronicles, The last story, Tales of the abyss 3DS, Pandora's tower? Unfortunately Xenoblade and The Last story aren't at E3, according to reports from 1Up. Uh, I think the page is derping a little bit. The word "undefined" is appearing over and over again at the top of the feed. So Luigi's mansion 2 is developed by Next level! Didn't they also develop the awesome Punch out wii? any purple 3DS's at e3? Yup, as well as Mario Strikers and its sequel. Not that it rules out a 3DS version completely, but it probably means we'll have to wait. Besides, it's a Japanese thing, that would be TGS material, not E3. But as Ubisoft probably had the most hand on time, and one of the first to get their paws on the dev kit. They also mentioned that not many others knew about it before the press conference. So it'll be interesting to see who sails on the ship of innovation, now in HD!